Just fill your sink with hot tap water, drop in the Grease Bullet, and soak your toughest baked on cookware. In just minutes, it will sparkle like new, inside and out, without scrubbing! 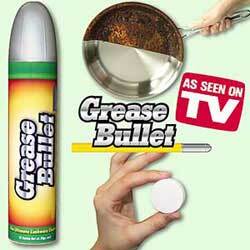 The Grease Bullet cuts thru caked on cookie sheets, grimy glassware, even scorched iron skillets!